Hollington United Football Club’s first team retained top spot after its 10th consecutive victory. 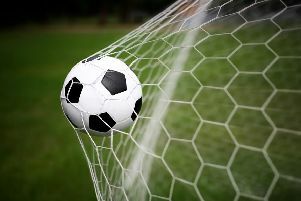 The Mid Sussex League Premier Division leaders triumphed 2-1 away to bottom-of-the-table Buxted to remain three points clear of second-placed Cuckfield Rangers, albeit having played two more matches. A strong wind and a pitch which was a little on the bumpy side made the game a scrappy affair. Despite the conditions, Hollington created enough chances to win three or four games, but some good goalkeeping and wayward finishing meant the match was always finely balanced. Dominic Clarke continued his goalscoring form by adding two more to his tally with two finely-taken goals during a first half in which Buxted equalised in between Clarke’s goals. The second half was one-way traffic, with chances again coming and going, despite the opposition’s physical approach. Man of the match, sponsored by Jules Lovell sport massage therapist, was Clarke. Hollington manager Scott Price said: “Trying to sum this game up is difficult. We dominated the game for 89 mins, switched off for one minute and got punished. “We controlled the game on an absolutely awful pitch and what pleased me more than anything was our discipline. “Their game plan was to get in our faces, kick us on and off the ball, and if we had a stronger ref, I genuinely believe they would have finished with seven players. “But massive credit to the boys, who kept their calm and just got the job done. I’m not one to normally pick referees out, but he wasn’t strong enough today. Hollington will travel to league rivals Sporting Lindfield in a hotly-anticipated Sussex Intermediate Challenge Cup semi-final next Saturday. Mid Sussex League Premier Division top five (played-points): 1 HOLLINGTON UNITED 19-49 (+33 goal difference), 2 Cuckfield Rangers 17-46 (+50), 3 Balcombe 18-43 (+43), 4 Lindfield 18-39 (+40), 5 Forest Row 21-31 (0).